If you are a person who rides every day, then bike speakers are the best inventions that you can ever dream of owning. Bicycle speakers can offer amazing sound quality. It’s easy to enjoy your favorite music while cycling, with no worries about crisp & clear audio. Bluetooth bicycle speakers have increased the ability for us to be able to ride and blast our tunes. No bulkiness or dangerous wires needed. In the past it wasn’t possible to do this until bluetooth improved. Finding the ultimate bicycle speaker can be a challenge. There are so many products on the market, which one should you get? We’ve done our testing, and our research so we can provide a detailed review of the best bike speakers. We’ve produced a buyers guide, like a cheat sheet to allow you to buy something that works for bikes. First, check the table below to learn about some of the features that have made us pick these products. Venstar S404 Wireless Bluetooth Sports Speaker is our top pick product on our list of the best bike speaker in the market. The device has been trail tested and proven to be among the ultimate rugged outdoor Bluetooth sport portable speakers. 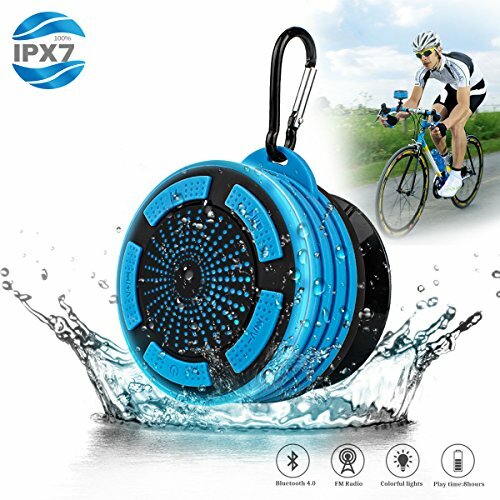 Besides, the bike speaker is dustproof, shockproof and waterproof, which makes it ideal for cycling, camping, shower, outdoor sports, hiking, poolside and much more. The bike speaker is essential cycling gear that includes BAS and Bluetooth 4.0 technology as well as 2 x3W speakers with audio technology that deliver stable HD audio. Moreover, Venstar S404 also features a built-in digital FM radio that includes auto scan presets. This allows for a playtime of up to 8 hours from any device that is Bluetooth enabled or listens to SD card. Besides, Venstar Bicycle Speaker is tough enough to withstand extreme conditions when cycling. The device comes with an outer shell that is made of high quality, durable and rubberized plastic. In addition, the bike speaker outer shell is compact, versatile, and water resistant with secure and grippy exterior mounted fitting. 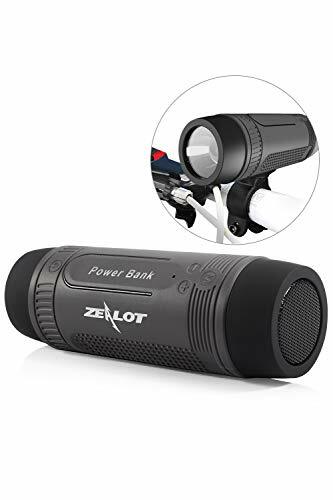 Zealot S1 Outdoor Bike Speakers is the best alternative to Venstar when it comes to choosing the best waterproof Bluetooth speaker under $50 today. This is because mounting Zealot S1 on the handle of your bike while keeping Bluetooth connected allows you to enjoy excellent music playback. Besides, it also allows for hands-free phone calls while cycling all along the way to your intended destination. On the other hand, pressing the power button transforms the Zealot S1 into a portable torchlight that enlightens your way while supporting TF card music playback and FM radio. The bike speaker can also be used as power bank or external battery making it one of the most reliable companions on your comfortable bike riding. The Zealot S404 bike speaker features a strong and stunning sound system that allows you to enjoy quality music. In addition, the device comes with a built-in Neodymium stereo amplifier, which is a 40 mm large driver. The amplifier allows you to enjoy a wonderful experience when talking on the phone by enhancing sound resolvement and fullness. Besides, Zealot S1 speakers include the latest Bluetooth CSR that provides the device with better passive and bass response subwoofer performance. The Celtic’s Blu Bluetooth system is one of the best Bluetooth speakers for the bike that offer the ultimate designs and reliability. Moreover, the device is 16 W power and 360 surround sound system speaker that includes BAS Technology. The BAS technology allows the bike speaker to generate a more penetrating and louder sound. The Celtic’s bike speaker is a bottle shaped device with 2.7 x 7.1 x 2.7 in dimensions in cup holder size. Moreover, the bike’s speaker comes with an extended lasting battery that allows for 30 hours of playtime. The Bluetooth bike speaker by Celtic provides for up to 100 feet Bluetooth connection and features a TF slot, which supports SD cards that store up to 8000 songs. With the long-lasting battery, the bluetooth speaker acts as a power bank that allows you to charge your phone and other devices. The device also includes an FM Radio and 3.5 mm AUX audio jack cable, which offers multiple modes that allows you to listen to your favorite audio media. 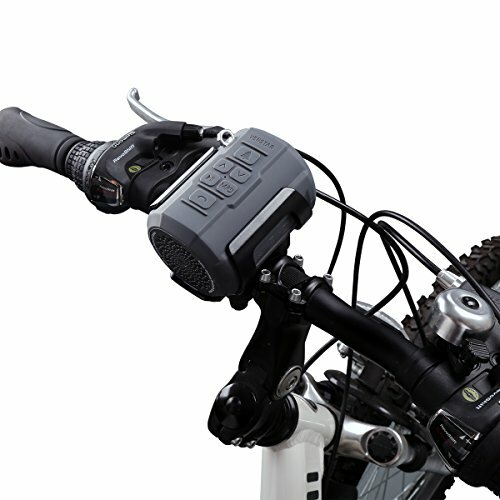 The speaker also includes an auxiliary remote controller, which now includes the volume control for safer and more convenient control, when riding your top mountain bike. Finally, the Celtic’s bike speaker comes with a full lifetime replacement warranty. ECEEN Wireless Bluetooth Bike Speaker is another top quality product that offers exceptional sound clarity. The speaker is designed with a built-in amplifier that ensures an amazingly loud volume. Besides, the product allows for the connection of any phone or MP3 player through the 3.5 mm AUX cable and Bluetooth. This enables you to answer phone calls using the call answer feature and the speakers built-in microphone. In addition, the bike speaker comes with rechargeable power battery with a capacity of 4000mAh that pack for up to 15 hours of continuous mobile phone charging and playing music. This makes it one of the best Bluetooth speakers for its reliability and its ability to support multiple functions. The ECEEN Bluetooth speaker includes a sturdy case that allows you to store your phone, MP3 device and sunglasses. Moreover, it is designed as a bike-mounted carrying case or protective pouch that helps in protecting these delicate devices from harsh weather conditions and shock. Finally, the ECEEN Bluetooth package includes the wireless bike speakers, 3.5 mm audio cable, micro USB cable and one piece of the instruction manual. Jarv Big Shot Bluetooth speaker is a quality product that features a premium sound system. This allows you to enjoy quality sounds from 2 x 3-watt Bluetooth speaker. Moreover, the Bluetooth speaker includes a powerful rechargeable battery offer over 30 hours of music through FM radio mode and up to 12 hours of music playtime in Bluetooth mode. Besides, the Jarv Bluetooth speaker is designed with a strong and tough exterior shell that is shock absorbing and durable. The device also features a water-resistant design. This makes Jarv Big Shot one of the ideal portable Bluetooth speakers that can be used at the beach, shower, and pool as well as for camping or hiking. Jarv Big Shot Bluetooth speaker comes with an excellent Wireless Bluetooth technology. This allows for playback streaming from any Bluetooth device that is compatible and positioned up to 33 feet from the speaker, which makes it a great choice for both outdoor and indoor use. Finally, the Bluetooth speaker comes with an inbuilt internal slot for Micro SD card, which enables to enjoy your playback without using a Bluetooth enabled device. Moreover, the wireless speaker includes a digital FM built-in radio tuner that is easy to program as it has auto scan presets. If you are looking for a Bluetooth bike speaker with a powerful sound system, the Avantree is another great option that you should consider. The Bluetooth speaker offers rich bass and bold sounds experience that allows you to enjoy your favorite music even when within noisy backgrounds. Besides, the device includes a passive bass radiator and 5 W, dual outdoor speakers. Avantree Portable Wireless Speaker is also one of the best Bluetooth speakers for bike and sports enthusiasts. 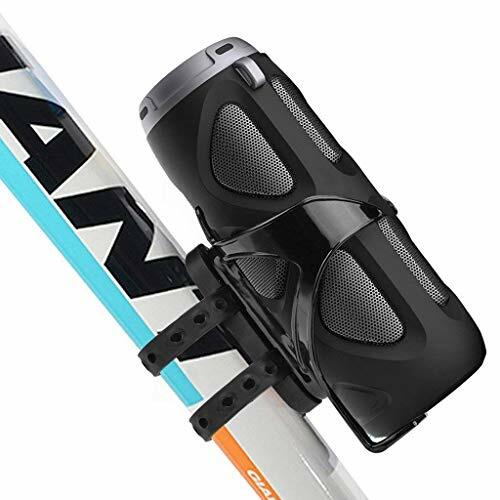 Moreover, the wireless speaker is designed with bike mount, shockproof rubber, splash proof exterior and snap hook design, which makes it ideal for hiking, cycling and much more. The Bluetooth speaker features three playing modes for better user experience. This enables the user to enjoy music from the portable and versatile speaker by choosing TF card or Micro SD, AUX line or Bluetooth. Besides, the wireless speaker is designed with a built-in microphone that enables to easily respond to your calls when cycling. Finally, Avantree Bluetooth Speaker includes Near Field Communication (NFC) technology. The technology makes it possible for you to start listening to music while on the move straight away by connecting the speaker to your phone if it is NFC-enabled. 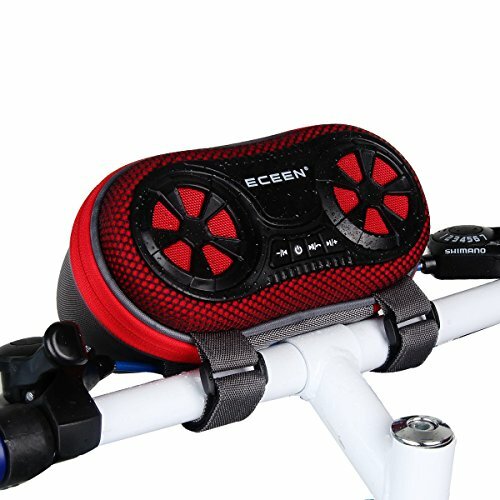 This is a portable waterproof Bluetooth speaker that comes with a two in one feature, as it is a shower speaker, but can also be used as a bicycle speaker. 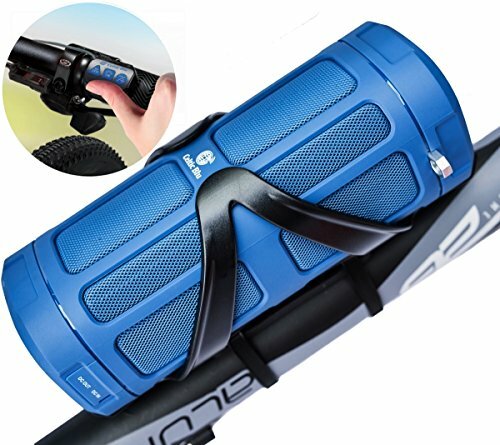 The Portable waterproof speaker includes a detachable suction cup that requires being taken off before mounting the speaker on the bike’s handlebar. This allows you to enjoy your amazing cycling while listening to your music. Mix Hero’s Bluetooth speaker features a fully enclosed design with waterproof function. The design helps in protecting the Bluetooth speaker from dust and external splashing. Therefore, the Bluetooth speaker can easily be used in a swimming pool, beach, and bathroom and outdoor safely. In addition, the Bluetooth speaker comes in a design that makes it easy to carry. The new hook design enables you to hang the wireless speaker on the side of the baby stroller or your backpack. This makes the device convenient to carry when cycling, climbing, traveling and hiking, which makes it a fantastic companion for any various outdoor activities. Finally, the Bluetooth speaker includes a built-in LED light and FM radio. The waterproof radio or shower radio combines with beautiful lighting making your shower as enjoyable as a party. 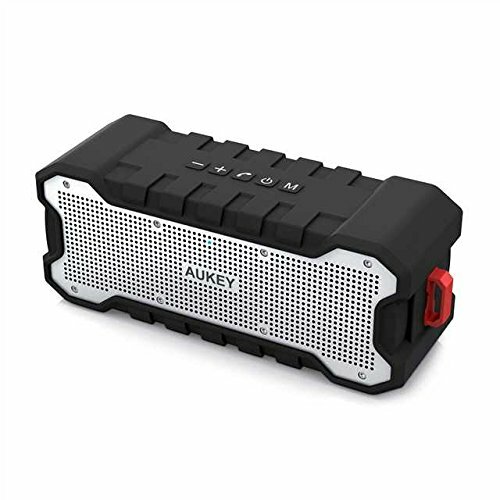 Aukey SK-M 15 Mini Cannon Portable Bluetooth Speaker is another reliable Bluetooth speaker that features a durable and a compact speaker driver (2 Watts). 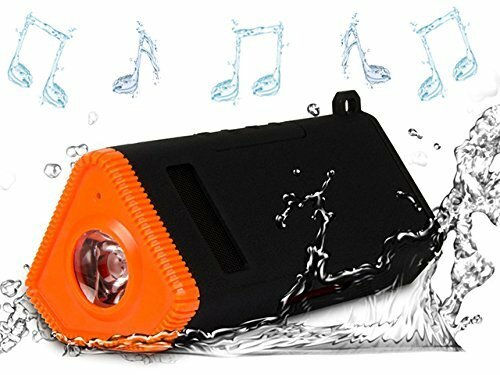 The speaker driver is surrounded by shock and water resistant tough exterior, which makes it one of the best waterproof Bluetooth speakers under $50. The Bluetooth speaker comes with a strong sound system that allows you to enjoy your music to the fullest. Therefore, the device produces distortion-free and balanced sound even when riding or taking a cold sip of your drinks on the porch. Aukey wireless speaker offers an option to listen to your music with your speaker plugged with a 3.5mm cable through 3.5mm AUX cable slot to your phone or any other device as well as stream music wirelessly from a Bluetooth enabled device or from your TF card or Micro SD. This empowers you to listen to your music from various media devices, which makes it more convenient than standard wireless bicycle speakers do. Finally, the package contents include Micro-USB cable, the SK-M15 Wireless Speaker, User manual and mounting strap. This makes mounting and using the Bluetooth bicycle speaker easy. The CLEARON Portable is one of the best Waterproof bicycle speakers that you can find in the market today. Apart from being water resistant, the speaker is also dustproof, shockproof and stain resistant, which enables it to retain its original color. Besides, the product offers 360-degree sound as it comes with 8W of sound power that is divided into 4W on one side and 4 W on the side. This ensures that you enjoy a fully penetrating 360-degree sound, which makes the speaker ideal for both indoor and outdoor gathering. The portable wireless speaker features a 2500 mAh battery that offers up to 12 hours of playtime. This enables you to listen to your favorite tunes continuously for an extended period without charging. Moreover, the battery includes an auto-off feature that helps in saving the battery. The bicycle mount of the speaker is durable and wear resistant, and therefore it can be pulled apart without damaging the shape, which means that it can withstand 44 PSI force. Besides, the FM Radio includes a built-in antenna that enables it to pick up local radio stations quickly. Finally, the product provides a MicroSD slot that allows up to 32 GB Card for storage of APE/WAV/WMA/MP3/FLAC files. Besides, the waterproof Bluetooth speaker includes a remote control that enables you to use your fingertips to play the music. Kmashi Waterproof LED USB Recharging Bike Light Wireless Speakers is perfect bike light is designed with three lighting modes. These include a Normal light mode for 32 hours, Bright Light mode for 16 hours and the SOS Light mode for 24 hours if the speaker is fully charged. Besides, the Bluetooth comes with humanized designed with IP66, which makes it one of the excellent bike speakers for extreme weather conditions. The Bluetooth speaker bike light is also ideal for adventure, night activities as well as any emergency circumstances. 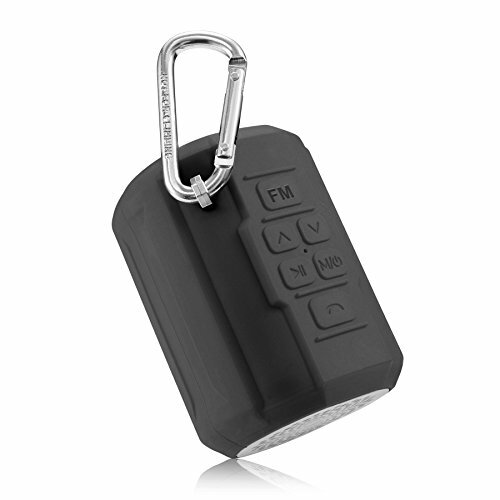 Kmashi Waterproof LED USB Rechargeable Bike Light Wireless Speaker features a premium rechargeable battery. The rechargeable battery comes with intelligent protection chip for a longer lifespan, which helps you save money. Besides, the battery can be fully charged within 8 hours by connecting speaker to the charge adapter with USB charge cable provided or connect to a computer. The Bluetooth speaker offers great wireless and multifunction freedom. In addition, the product includes a V4.0 speaker with TF card or Bluetooth, bike light and 4800mAh portable charger. Besides, it supports Bluetooth connection within a range of up to 33 feet and hands-free phone calls. If you can understand the products, and their varying features it will make your life easier. Once you understand these factors, you can make a choice that you won’t regret. Multiple connectivity options is an important feature as in one time or another you will want to connect your speaker to devices that do not offer Bluetooth options. Therefore, when choosing a product it is wise to check whether the speaker supports other connecting docks such as MicroSD Card, Auxiliary or USB connectivity. Bicycle speaker should offer a surround sound system that allows you to enjoy the music over the wind and other noises in the background. In this case, dual speakers are more preferred as they are designed with the ability to create a 360-degree effect by dividing the sound and directing it in all directions. Bike speakers with rechargeable batteries are better as they help in saving money and allow you to enjoy your favorite music without any restriction. Besides, Bluetooth speakers with rechargeable batteries serve you longer than their counterparts that require replacing batteries occasionally do. If you are looking for a bicycle Bluetooth speaker, then it is obvious that you will use it for outdoor activities. Therefore, it is advisable to opt for a product that features sturdy construction, which makes it capable of withstanding extreme conditions and lasting longer. For those who enjoy listening to local stations or talk shows, it is important to choose a Bluetooth speaker with inbuilt antennae for FM radio. Most of the best Bluetooth bike speakers offer at least 100 feet Bluetooth connectivity range. Long range Bluetooth connectivity helps in ensuring easy connectivity without disturbance, static or constant worries of having the connecting media device with the required proximity. Bluetooth bike speakers with microphone chip allow the users to comfortably attend to calls as well as give directions to programs such as SIRI without interfering with activities at hand. The bike speakers should offer multiple mounting options apart from bicycle mounts such as straps or thread inserts to mount the product on the backpack, especially when hiking or camping. If you are a user that is thinking of embarking on a long trip or camping, it is good to opt for a product with a strong battery that allows it to act as a power bank for subsequent media devices. What are the Major Benefits of Purchasing a Bluetooth Bike Speaker? Bluetooth bike speakers do not require to be connected to subsequent media devices as they can be connected with Bluetooth to devices within close proximity. The best bike speakers are going to depend on the kind of bike you have and even the kind of audio you want to play. 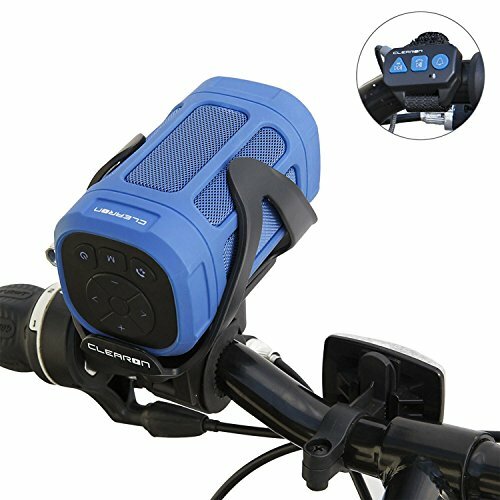 Purchasing a bike speaker does allow you to enjoy your favorite music as you cycle. Headphones are dangerous at the best of times, so a mounted bike speaker can save your life. With your new found knowledge, you should be able to make the right choice for you.